The 6th Asian Regional Conference on Geosynthetics was scheduled in India this year from 8th – 11th November. 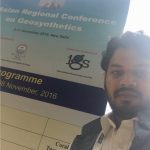 This was the second event hosted in India after the First Asian Regional Conference on Geosynthetics held in 1997. The Asian Regional Conference on Geosynthetics is organized quarterly to exchange ideas, share experiences and let people collaborate for the success of infrastructure projects. The Indian Chapter of IGS organized the Conference enthusiastically, in association with Central Board of Irrigation and Power. The venue Manekshaw Centre, Delhi was selected thoughtfully; the decor illustrating the rich ethics and traditions of the Indian Army and our country’s cultural heritage. Prof. Jorge G. Zornberg and W. J. Murray, Jr. Fellow in Engineering, The University of Texas at Austin Civil, Architectural and Environmental Engineering Department and Immediate Past-President, International Geosynthetics Society delivered the Mercer Lecture this year. After the inspiring speech and Inaugural function, I also took time to check out the area of exhibitions. Exhibitors from UAE, Germany, France, China, Italy, Malaysia also participated in the Conference. Charankattu Coir Mfg. Co. (P) Ltd., Flexituff International Ltd.,Garware Wall Ropes Ltd., Geosynthetic Testing Services Pvt Ltd., Megaplast (I) Pvt. Ltd, India Mexichem Geosynthetics, and National Jute Board SKAPS Industries were some of the Indian exhibitors of the Conference. The conference was very enlightening with many speeches and Prof. Zornberg’s lecture reflected his 25 years experience and insights. Apart from this, I was also selected as ‘the lucky one’ in the first day of after conference party where I met many knowledgeable people. This Conference promoted a wonderful exchange of information among the geotechnical engineers and geotechnical industry. Geo Spar Infra is a specialized Geo Engineering Company with more than 30 years of experience in designing and executing complex Geotechnical, Civil, Electrical and Engineering Projects. Contact us for all your Geotechnical needs.